This is a major initiative of the Friends of the Mounted Police Heritage Centre and RCMP Veterans’ Association, dedicated to recognizing all Members of the Royal Canadian Mounted Police (RCMP) who have honourably served. Officers who, day in and day out, answer the call to duty often under difficult and challenging circumstances. They are among Canada’s best and are indeed, the “Pillars of the Force”. This initiative also recognizes the dedicated public service employees, the community at large and families who support the Members on the front line. 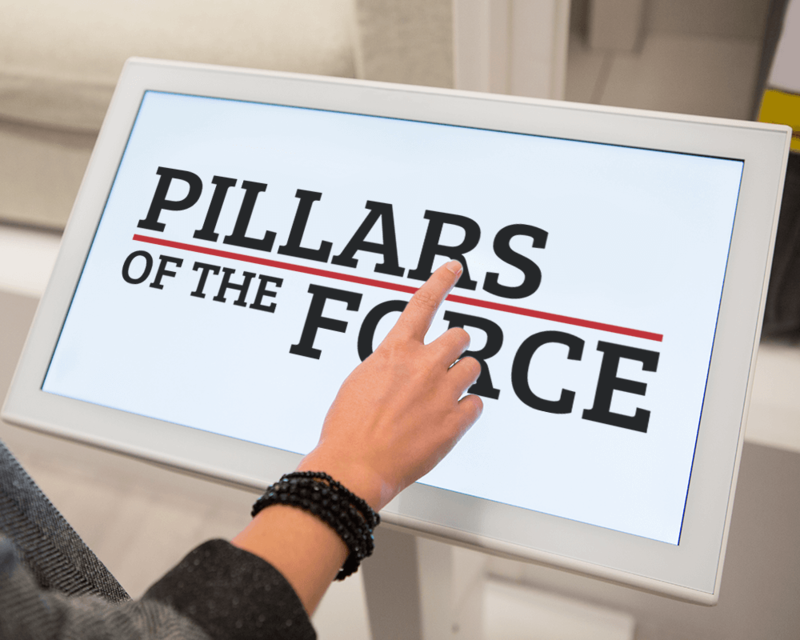 The “Pillars of the Force” will open to the public at the RCMP Veterans’ Association AGM in Regina, “Home of the RCMP” in June of 2020. 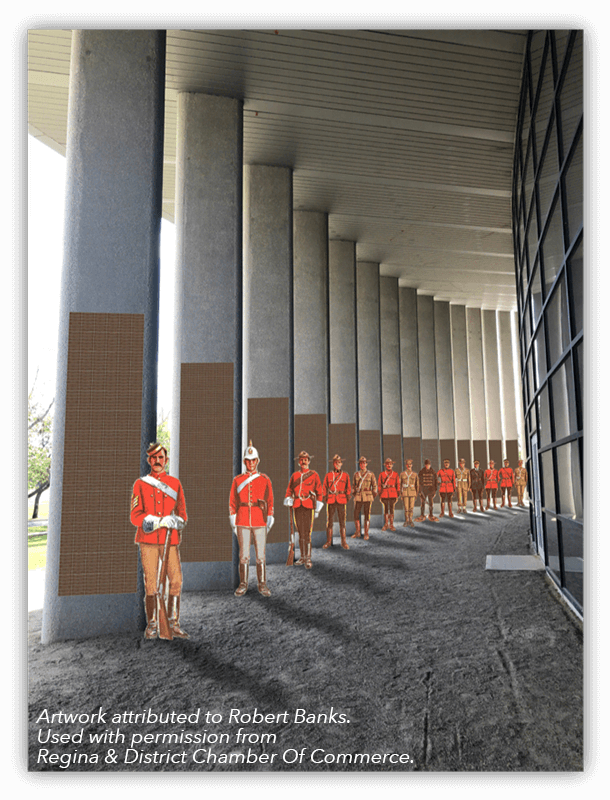 Once opened, the “Princess Royal Walk” and the adjacent pillars along the front of the RCMP Heritage Centre will be transformed into a living legacy of those who serve and have served as it continues to grow over the following years. This initiative will also provide financial support to ensure the legacy is shared with generations to come. A donation of $300* ensures a 6×1.5 inch nameplate is displayed on a pillar for a member who has honourably served. The nameplate will include the member’s name, regimental number and troop and is 6 inches wide and 1.5 inches tall. – The tradition lives here. Ensuring the legacy continues. – NOTE: Member is defined per the RCMP Act, Section 5, SS 6(3), (4) & 7(1). * – A charitable tax receipt will be issued for the full amount of the donation. 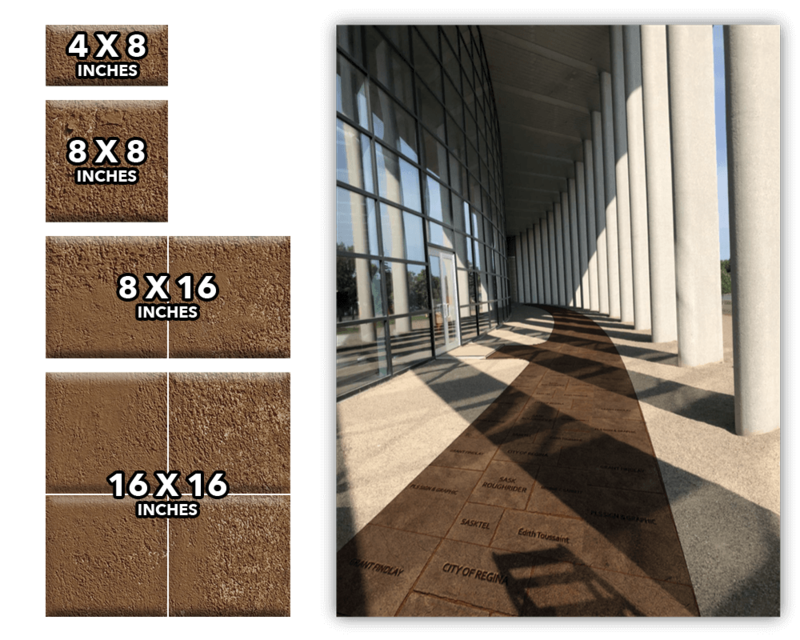 A donation of $300* will provide public servants, family members, community individuals and organizations with a 4×8 inch brick on the Princess Royal Walk to show their support for the members of the Force. A virtual pillar wall located inside the Heritage Centre will provide a platform to share the Member’s story of service** and serve as a database to easily locate individual nameplates and bricks. ** – Information required for posting on the virtual wall will be forwarded to you following receipt and validation of your initial submission. STAKE YOUR CLAIM! SHARE YOUR STORY! “You are part of this unique Canadian story”. Claim a personalized nameplate or brick. Get started by following the steps in the “Make a Donation” section below. Troop members, teams, or generational family members may be placed together on the pillars or walkway. However, one person must collect all donations, gather relevant information and submit with a REQUEST for the noted persons to be posted together. Any family member or friend may donate and submit relevant information on behalf of a deceased Member/Veteran or qualifying person to be posted on the pillars or the walkway. Ways you can make your donation: By Mail (Cheque), By Phone (Credit card), or Online (Click “Donate Online” Below). R.T. (Bob) Smart, (RCMP Rtd.) President, Friends of the MP Heritage Centre. 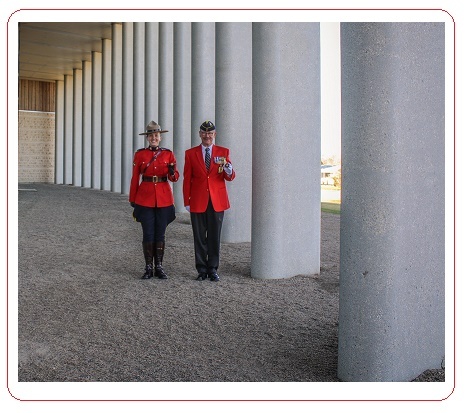 “As a retired couple (with the bulk of our service on the Musical Ride), we feel this inspiring initiative will help celebrate and recognize all members of the RCMP and forever commemorate their contributions, stories and service to the Force and the communities they have served, as PILLARS! Step 1: Decide how many Nameplates and/or Bricks you’d like and calculate your total donation. If you’re making your donation by mail, please download the claim form, fill it out, and include it with your cheque. If you’re making your donation by phone or online, please download the claim form, fill out the form electronically, save the file, and email the form as an attachment to FRIENDS@RCMPHC.COM. You may also print, scan, and email the form. Make your donation by Credit Card over the phone or online. When you’re ready, please call (306) 719-3015. Donate online using our Donation form. Download a list of frequently asked questions and their answers. Download a copy of our digital brochure in English.